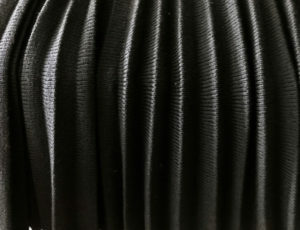 Open tubular knitting using the ribber is possible in nearly every width. The wider the cord, the more it will want to flatten. Wire, various cording, and plastic tubing may all be inserted into the tubes if more sculptural forms are the goal. An added note: the easiest cord is a narrow knit strip, knit on at tighter than normal tension, which will roll into itself, helping it retain its shape and in turn be substituted in many of the fabrics using icords. For wide strips that need to bend and curve, ribbed strips my work, particularly if knit in english or half english rib. Such ribbed strips may be braided flat, stitched together and in turn applied to sweater panels at their edges, center fronts, etc. The symbol below usually represents a single increase. In hand knitting such increases may be achieved anywhere in any one row. In machine knitting however, this may only be done with any ease at garment edges. Machine knitters may be familiar with calling what is depicted below a full fashioned increase. 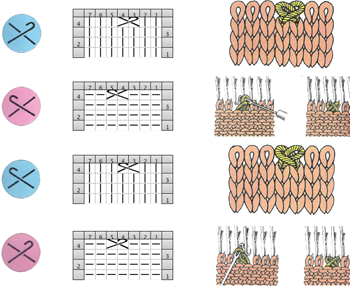 To achieve the latter, a multiple prong tool is used to move the chosen stitches a number over to the right or to the left. On the machine, the resulting empty needle then needs to be “filled” unless lace holes created without doing so are part of the design; this may be done by picking up the purl bar from the row below. The blue dots represents the HK symbol, the pink the same symbol as it might be represented for MK to achieve the same result. The machine knit illustrations in this series do not factor in automatic patterning: rather, they show how the stitches would be hand tooled on the machine to achieve similar fabrics. brioche/tuck stitch: the first 2 image series show “normal” orientation, the 3rd and 4th series the twisted in front of knit version. In MK the elongated stitch is twisted and returned to its needle; similar fabric may be created purely through hand technique by using holding on single needles in desired locations. Tucked rows in KM programming are unpunched squares in card, white “squares” in mylars or computer downloads. 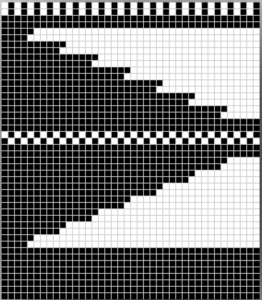 Using the repeat below, in electronics it is possible to “draw” only the 3 tucked squares, and use color reverse. slip stitch: the first 2 image series show “normal” orientation. In machine knitting the slipped, elongated stitch is created on knit side, with the remaining “floats/bars” remaining on the purl. 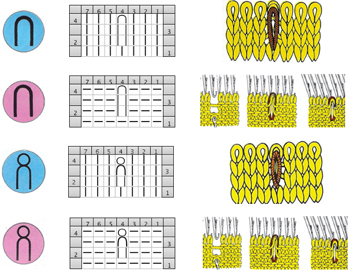 In the 3rd and 4th image series the elongated stitch moves to the back of the work, while the “floats/bars” move to knit side of the fabric and form a pattern on it. 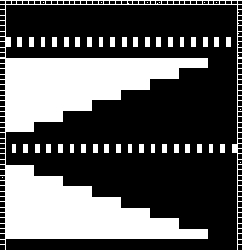 As with tuck stitches, rows for slip in KM programming are unpunched squares in card, white “squares” in mylars or computer downloads. Using the repeat below, in electronics it is possible to “draw” only the 2 slipped squares, and use color reverse. Because in this fabric the needles are skipped, not filled with loops, multiple punched holes or white squares may occur side by side. If the goal is to achieve the skip stitch floats appearing on the knit side, retooling by hand is required on all skipped needles prior to the next all knit row. stitches woven through stitches: because of the fixed width stitches must travel with any crossings on the machine there are limits as to how far they are able to move across the bed within any one row. Cables come to mind immediately in terms of stitches crossing; another type of cross weaves stitches through others singly or in sets, which may also be done within rows of long stitches. 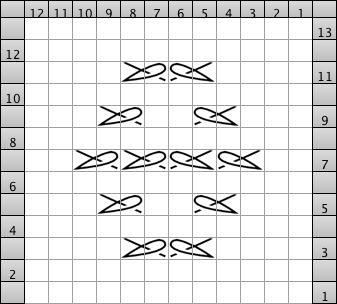 In the illustration below, one stitch crosses through the center of another. If one is trying to match the hand knit fabric version, then the direction of the “weaving” is reversed as it would be in the case of cabling. 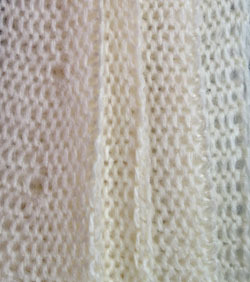 Light colors and thick yarn help make the results more visible. This is strictly a hand technique; however, for greater accuracy and speed one may program card or electronics to select either the needle that comes off first, or the pair of needles involved involved with the cross. November 2015 PS: the charts such as the one immediately above were created using Intwined Pattern Studio and my own custom made stitch symbols. The program on Mac not long after became unusable due to the presence of custom made stitches in library, took multiple efforts to restore without their presence, and there have been no updates since then to address this, or any of the other issues. More information and reviews may be found on ravelry. 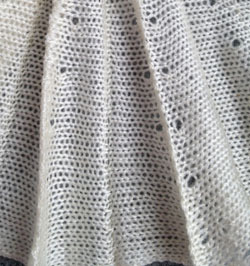 One of the critical differences in viewing work as it progresses on the knitting machine, is that the “front” view of the fabric unless the work is removed from the needles through a variety of techniques and turned over on the needle bed, is the purl side. Early machine manufacturer punchcard book publications made an effort to help hand knitters make the transition. A chart from brother publishing knit_sym96 illustrates one such effort. Here the middle icon in the how to work column is the stitch formation one would need to achieve on the MK to get the same “look” as the HK samples. 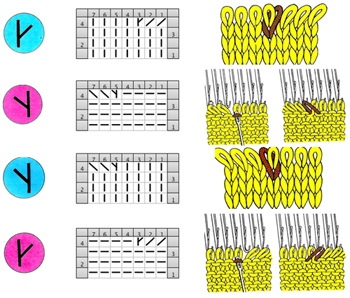 Some symbols apply to both types of knitting, some should be mirrored horizontally to make sense, and in the case of the crossing stitches at top right of the second column there is a bit of confused identity. Over the years there has been an interesting transition from hand written stitch by stitch instructions to the introduction of symbols ranging from home grown on graph paper, to simple word processing and later software generated ones. Some international differences occurred in published works, and international agreed upon symbols for both knit and crochet eventually evolved. There are many design programs on the market now, I have linked to some in past posts. As knitters have venues for publishing their own repeats and patterns and tools have multiplied, symbols do not always necessarily have the same meaning, and stitch codes are no longer universal. 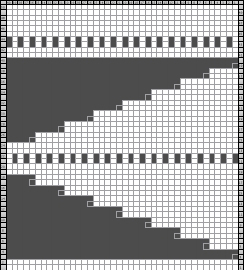 I have been wanting to find a way other than using excel to build a stitch library usable for machine knitters in an easily accessible program that would do some of the “work” for me. I have experimented with 2 programs. One was knitbird, which I would not recommend for this purpose, the other Intwined Studio which is proving far more flexible and worth the modest investment for me. I work on MacOS10.8, the Intwined version for this OS is beta. There are some small glitches, but this is a tool worth exploring. The option is there to add one’s own symbols to the stitch library. I have begun working on a machine knitting set with icons created in a combination of other programs and Inkscape, the one suggested in the tutorial by the developer. Some charts created with Intwined may be seen in my previous post on sideways pleated skirts. Below is a chart including some MK symbols in my personal library, also using the option to color background for them in program itself rather than editing the chart image after the fact. To download Inkscape: site. The work around to get the program to work in Mac OS10.8 may be found here. The combination of color with symbols in published patterns for both hand knit and crochet is beginning to proliferate. I find the visual color cues help track patterns more easily, have done it in HK in the past, one such example is my chain cable experiment in my January 3rd post. Some illustrations for lace symbols HK vs MK may be found in my post February 25, 2012 “back to lace”. This post was originally written in 2013. I found myself reviewing it in 2018, and editing it with the intent to attempt a pleat sample using the Ayab interface. In those days I was using Intwined for some of my charts. The program has since been unsupported for Mac, without upgrades and a series of problems that led to my switching over to excel completely for my charts, and now to Numbers in the latest Mac OS. I work primarily on multiple model Brother machines, in this instance the 910. Some of the information provided below may need tweaking for use in other brand KMs. 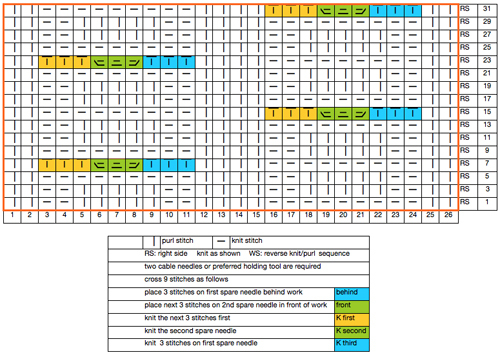 “Automation” of some holding functions may be achieved using slip setting to knit required stitches. Below is the mylar sheet repeat used for my samples swatches. The setup is on working needles 21L, 19R, program for color reverse and twice the height; KCII (cancel end needle selection); first row needle selection from left to right, and with carriage ending on the right the first set of needles selected will be those that knit, the remaining bed will slip. This is opposite to the configuration familiar in holding, where needles out to E are held, those in B or D will knit (Brother needle position jumped the letter C, they are A,B,D,E). In this type of knitting all needles in use on the bed should be cleared with each pass of the carriage. 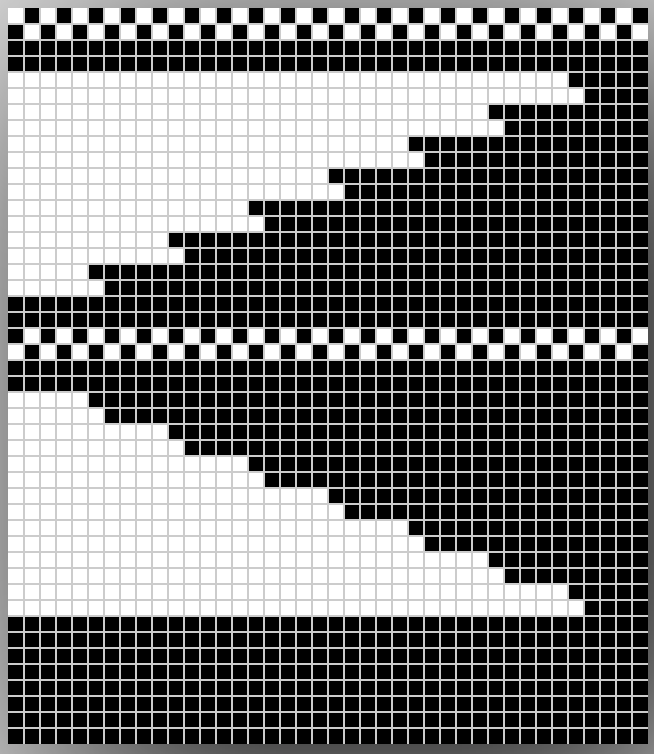 In the samples below the first set of every other stitch/ black square in the increasing/decreasing angles were slipped on the non selected needles to create/mark the inner purl fold , the second set in the area that does straight knitting tucked on non selected needles to create/mark the knit outer fold. For the latter to occur, the cam buttons need to be switched to tuck <-> for 2 rows, and then back to slip <-> for the remaining knit repeat. Small holes are created at edges of slipped areas as miters are created, as would appear were the fabric created tthrough holding. 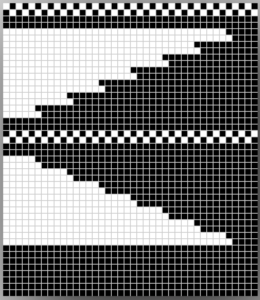 The look may be varied considerably by changing the sequencing of the number of knit stitches, and the number of plain knit rows between the EON slipped or tucked ones. Electronics facilitate that, and with machines capable of accepting programming of the whole needle bed, there is even greater freedom. 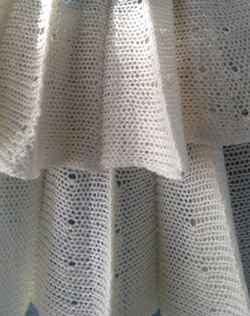 The sample above was knit loosely in acrylic, the holes would be less apparent in a tighter knit. If bothersome, they may in theory be “avoided” by factoring in “wrapping” if every row of the repeat is drawn rather than every other. With only 60 squares available on the mylar it is possible to go twice as wide and produce fabric width that may suffice for a skirt’s length. 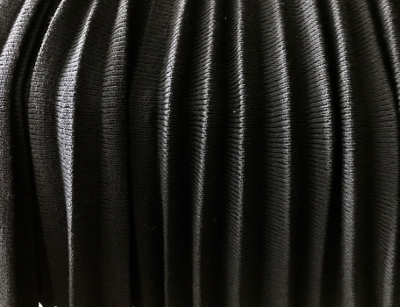 With software that allows for programming the width of the needle bed, possibilities expand even more. When going double wide with a repeat such as the one above, some problems result not so much in the inner fold slipped rows, but in the outer fold of the tuck ones. As in nearly any knitting when needles have 2 side by side loops resting on them, these loops will create a float/ ladder, so the tuck rows will essentially behave like the slipped ones as the double loops are dropped rather than anchored on the subsequent pass of the carriage. 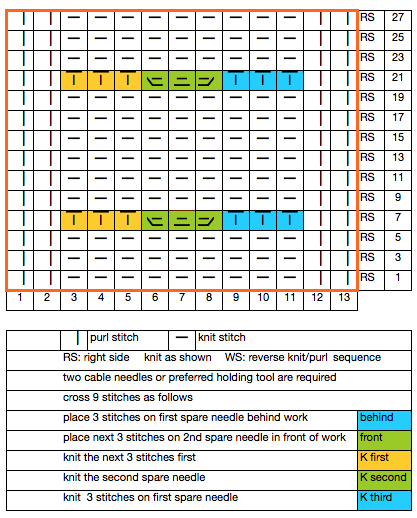 In the configuration here if the double wide button is used, one way to solve that issue would be to bring consistently the same of either of the 2 non selected needles out to D or E position (still faster than hand selecting repeats by hand for holding), resulting in knit stitches and single tuck loops. 5/18/18 Working out the kinks: the same repeat redrawn to factor in reduction of the eyelets at edges of slipped areas: a partial graph showing “automatic wrap”. 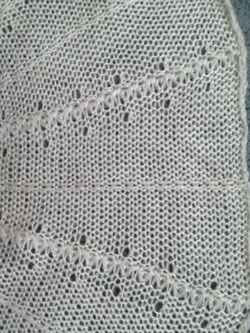 However, the “wrap” will fail with color reverse, and that first row would have only one stitch knitting. If double wide is used, then the wrap will happen around 2 needles, creating yet another “float”. Below the edited repeat begins design using one pixel per stitch and per row. 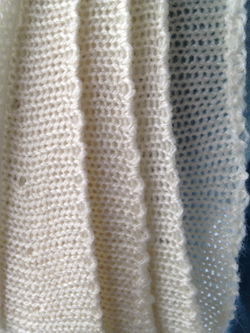 “Automatic” wrap happens as one row is knit, while the next preselects an extra needle. The yarn travels under the extra needle prior to its being knit on the next pass from the opposite side. There will still be an eyelet, a bit larger than hand wrapping, but smaller than without any wrap at all. 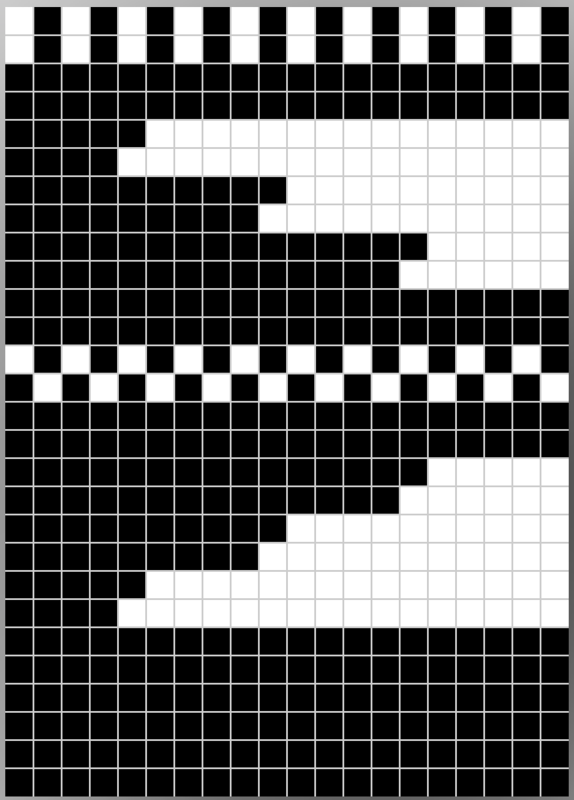 The EON pixels in the center of the shape are tucked. For that to happen the knit carriage needs to have the cam buttons switched from slip to tuck, and back to slip after the 2 row sequence. The fabric fold out to the knit side. The EON (every other needle) set at the top of the shape are knit is slip stitch setting, resulting in the fabric folding in to the purl side. 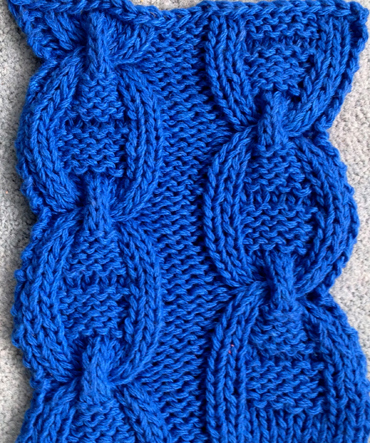 Process could be reversed to have each fold to the opposite side of the knit. The carriage needs to be on the opposite side of increases in the number of stitches worked. 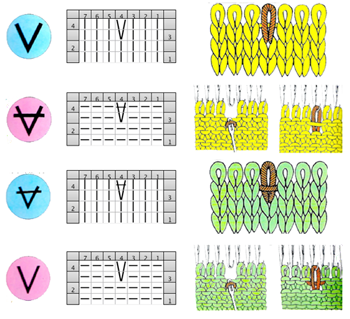 Here the first preselection row should be from left to right, with carriage traveling to and from right for the subsequent pairs of rows. 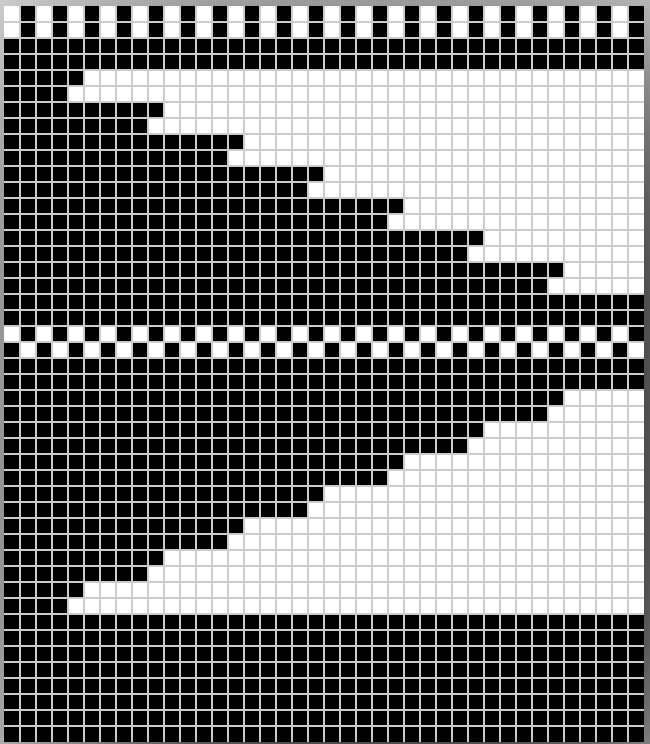 More variations: the slip stitch configuration below is changed to the same EON selection for 2 rows. The same could be done for the tuck fold. For this repeat, the first preselection row should be from right to left, making that the side the knit carriage returns to after each pair of rows knit. The sample was knit in a too thin acrylic. Both eyelets and their “wraps are visible, as well as the direction of folds. An added alternative for fold lines: create outside crease transferring EON to make a row of eyelets, create inside crease by knitting the desired row double row of with 2 strands of garment yarn. “Automatic” repeat must be adjusted accordingly, whether by re drawing or punching, or using cam settings for the correct stitch formation. Seaming should be planned on the inner fold of the fabric, depending on whether the purl or knit side is used as the “public” side, the least visible join being one that is grafted ie with kitchener stitch. I usually sample my repeats by using hand selection and holding before committing to drawing on mylar or punching holes. The former are hard to get, the latter time consuming to punch, and “repairs” are more difficult when there are that many holes side by side. An even number of rows is required in this technique. This is the latest type of fabric to cross my radar. One publication readily available online is at Susan Guagliumi’s website (log in and sign up required initially). My own in progress notes/ideas Pleats in full needle rib2, and SINGLE BED PLEATS. Some single bed pleating may be automated. Revisions, additions and photos will follow.